Think of Congaree National Park in Hopkins, South Carolina, as the place where snappy singles sync. For two to three weeks between mid-May and mid-June, the park becomes a breeding ground for Photuris frontalis fireflies (also known as the Snappy Single Sync species), who put on what is arguably one of nature’s more beautiful lightshows. For those few weeks, the fireflies abandon their tendency to flash on and off at random and instead, join together in a synchronous pattern of flashing all at once. “The flash pattern is a form of communication that helps males and females identify each other,” Greg Cunningham, the Chief of Interpretation at Congaree National Park, told Smithsonian.com. Cunningham noted that different firefly species have different flash patterns, but only a few of the 2,000-plus firefly species worldwide flash in synchronicity. Only three species in North America are synchronous: P. frontalis in Congaree, Photinus carolinus (or the Smokies Synchronous Firefly) at the Great Smoky Mountains National Park and in the Alleghenies, and Photinus knulli in Arizona—though this species doesn’t produce quite the spectacle as the other two because it’s comprised of such a small population. Why these specific species flash in sync and others don’t is still being studied—but we do know that it’s all an elaborate mating ritual. The males show up and light up to attract the female fireflies, who watch from a distance and respond with their own twinkling light show. Research suggests that the male fireflies that flash the longest may be considered ideal mates. The spectacle continues until firefly couples match up to mate. The annual synchronous firefly show lights up the ground, sparkling and twinkling like a forest full of fairies or fallen stars. The bugs in Congaree fly only two to four feet above the ground, and the light often shimmers against the swampland beneath them. “Because the park is home to old-growth bottomland hardwood forest, the park is a prime habitat for this particular species,” Cunningham said. Still, most travelers tend to head to the Smokies to catch the spectacle there—which probably isn’t the best choice. 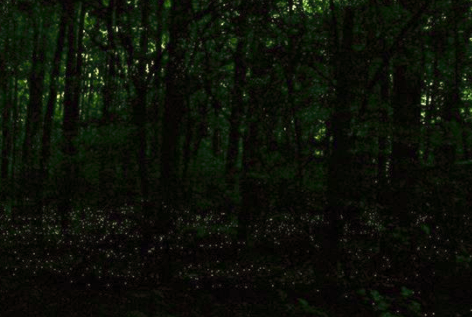 To get a chance to see the synchronous fireflies in the Smokies, you’ll need to sign up for a lottery and, if you win a ticket, take a shuttle to one specific area of the park that will then be overcrowded with the people from the bus. At Congaree, no bus is necessary; the fireflies light up less than a quarter-mile from the parking lot, and you can see them right from the nearby boardwalk. And it doesn’t get as crowded, so you can stand in awe of the light show, enjoying for the fairy tale experience it truly is.